Download "EU chemicals management rules and your clients business"
4 4 Guide for SME Advisers EU chemicals management rules and your clients business About us THE EUROPEAN CHEMICALS AGENCY Established on 1 June 2007, the European Chemicals Agency (ECHA) is at the centre of the regulatory system for chemicals in the European Union (EU), which has changed in recent years with the introduction of four new regulations that ensure the free movement of chemicals in the EU and a high level of protection for human health and the environment: REACH - Registration, Evaluation, Authorisation and restriction of Chemicals; CLP Classification, Labelling and Packaging of substances and mixtures; BPR Biocidal Products Regulation; PIC Prior Informed Consent in the international trade of hazardous chemicals and pesticides. These legislative acts are applicable in all EU Member States without the need for transposition into national law. ECHA ensures the consistent implementation of these regulations across the European Union and the countries in the European Economic Area Iceland, Liechtenstein and Norway. ECHA S MISSION ECHA is the driving force among regulatory authorities in implementing the EU s ground-breaking chemicals legislation for the benefit of human health and the environment as well as for innovation and competitiveness. ECHA helps companies to comply with the legislation, advances the safe use of chemicals, provides information on chemicals and addresses chemicals of concern. 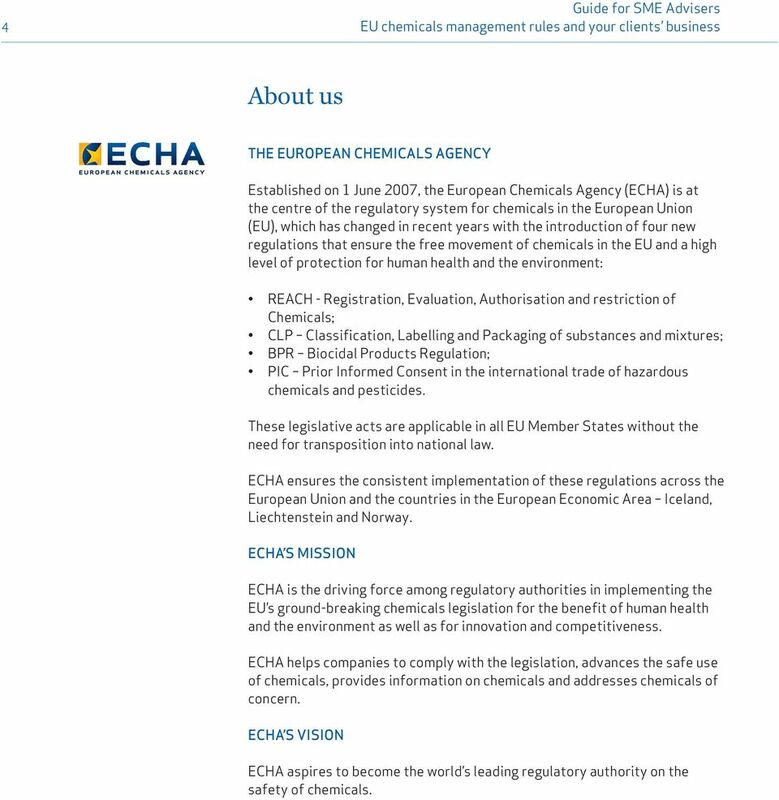 ECHA S VISION ECHA aspires to become the world s leading regulatory authority on the safety of chemicals. 5 Guide for SME Advisers EU chemicals management rules and your clients business 5 THE ENTERPRISE EUROPE NETWORK The Enterprise Europe Network is a key instrument in the EU strategy to boost growth and jobs. Bringing together around 600 business support organisations from across Europe and beyond, we help small companies seize unparalleled business opportunities in the EU Single Market. Our member organisations include chambers of commerce and industry, technology centres, research institutes and development agencies. Most of them have been supporting local businesses for a long time. They know their clients strengths and needs and they know Europe. As members of the Enterprise Europe Network they are linked up through powerful databases, sharing their knowledge and sourcing technologies and business partners across all Network countries. They are also closely linked with the European Commission, which enables them to keep abreast of EU policies and to feed small companies views on them back to Brussels. SERVICES TAILORED TO SMALL COMPANIES Supporting small business is a cornerstone of the EU s drive for growth and jobs. As 99% of all EU companies are small and medium-sized enterprises (SMEs), accounting for 67% of jobs, what is good for SMEs is good for Europe s economy. 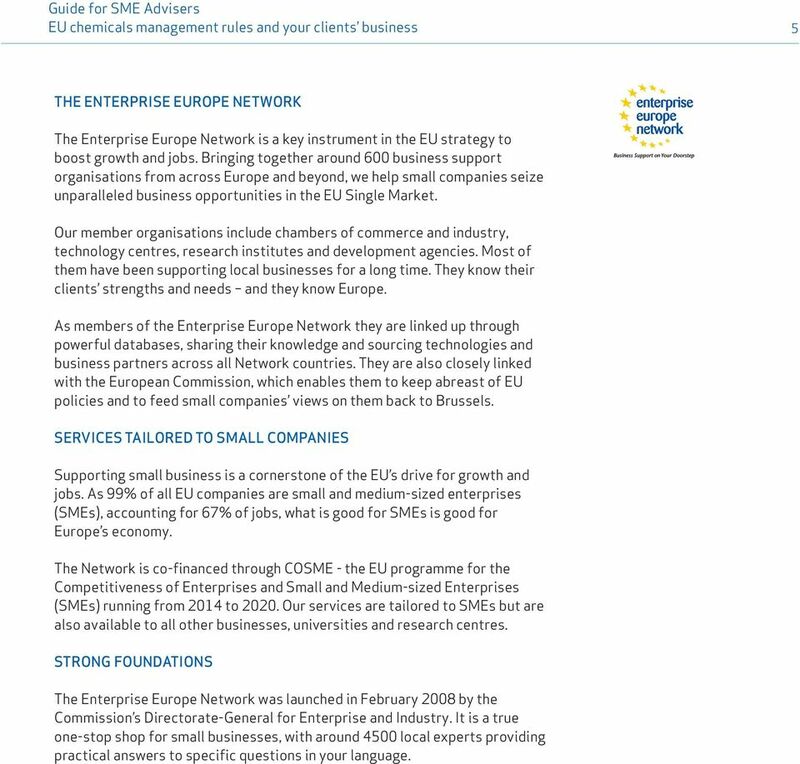 The Network is co-financed through COSME - the EU programme for the Competitiveness of Enterprises and Small and Medium-sized Enterprises (SMEs) running from 2014 to Our services are tailored to SMEs but are also available to all other businesses, universities and research centres. STRONG FOUNDATIONS The Enterprise Europe Network was launched in February 2008 by the Commission s Directorate-General for Enterprise and Industry. It is a true one-stop shop for small businesses, with around 4500 local experts providing practical answers to specific questions in your language. 7 Guide for SME Advisers EU chemicals management rules and your clients business 7 Did you know? 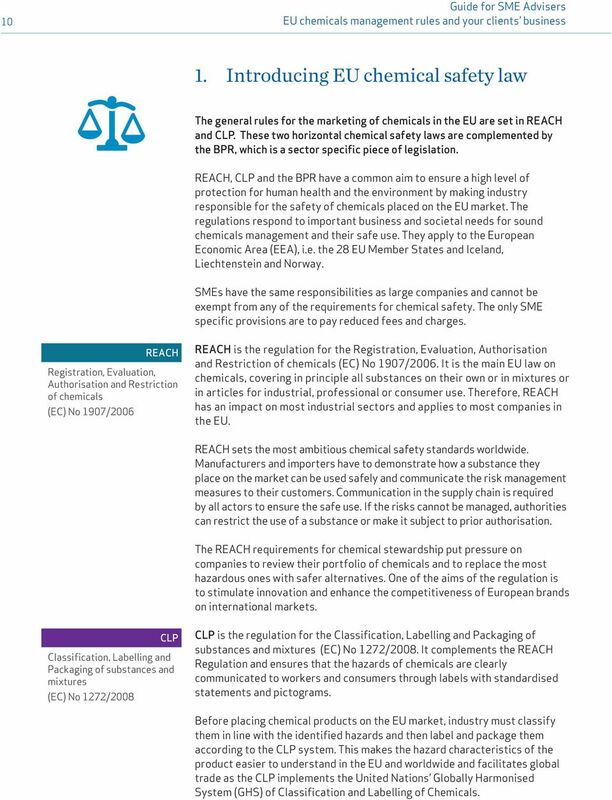 The EU regulations for the Registration, Evaluation, Authorisation and Restriction of Chemicals (REACH), for the Classification, Labelling and Packaging of substances and mixtures (CLP) and the Biocidal Products Regulation (BPR) have an impact on the business of most companies in the EU and in Iceland, Liechtenstein and Norway, which are part of the European Economic Area (EEA). Recent surveys and inspections in 30 countries show that nearly 70% of the Small and Medium-sized Enterprises (SMEs) outside the chemical sector are not aware that e.g. REACH and CLP have a direct impact on their business. Smaller companies by their turnover are least likely to believe that they have to comply with REACH. Such companies risk placing non-compliant, unsafe chemical products on the market. Some of them may be your clients and may need help to comply or business support to review their portfolio and reposition their business offer as a result of REACH, CLP and the BPR. If their business partners are based outside the EU, they may have to make them aware of the rules for importing chemical products into the EU. Furthermore, surveys of SMEs and manufacturing companies show that when SMEs are aware of these EU regulations and know how they affect their business, they are the most active in re-designing their manufacturing process. Companies of all sizes are also involved in replacing the most hazardous chemical products with safer alternatives. Complying with the EU chemicals legislation can trigger business decisions which can be beneficial for companies and enhance their brand. Not all SMEs can do this alone and may need your help. 9 Guide for SME Advisers EU chemicals management rules and your clients business 9 This guide - how can you use it? The Enterprise Europe Network (EEN) acts as the link between EU policies and SMEs. In your daily work you meet companies from many industrial sectors who may not be aware of EU chemicals legislation and that it can help make things better for them. You may also be getting questions from companies that are aware they have to comply, but do not know where to start or what to do next. 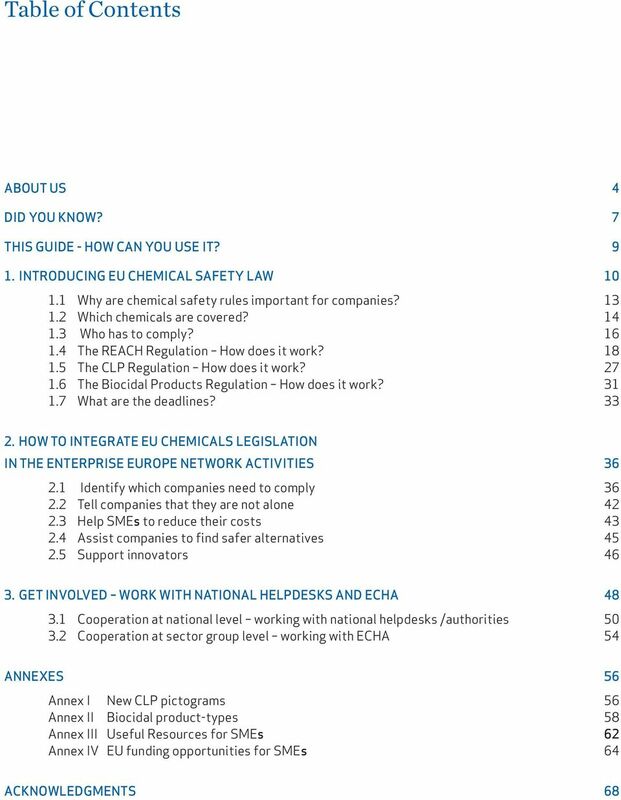 This guide was developed on request by Network partners who took part in the first training for Enterprise Europe Network on EU chemicals legislation why is it the business of non-chemical companies. 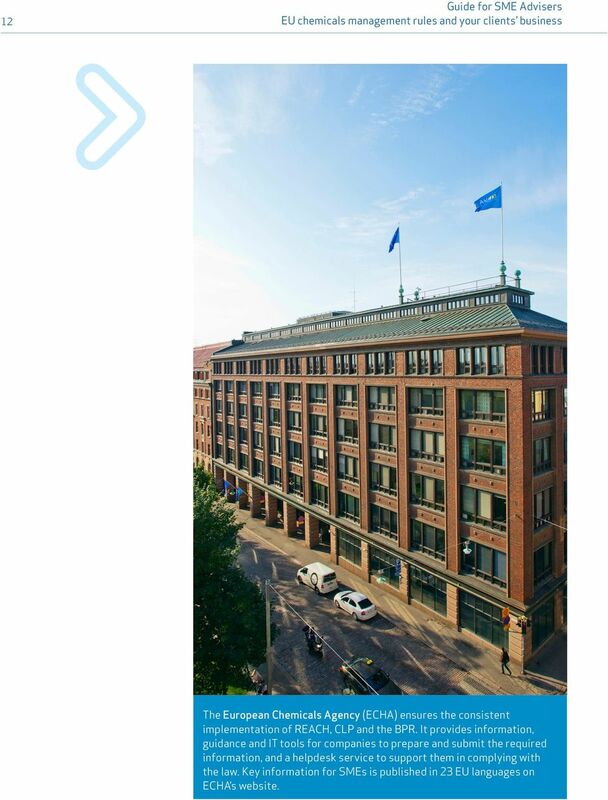 It was organised in 2013 jointly by ECHA, the Executive Agency for Small and Medium Sized Enterprises (EASME) and Enterprise Europe Network-Finland. Network partners have been directly involved in developing and drafting this guide. National helpdesks supporting companies to comply with the legislation have also provided input to the guide. Its aim is to enable both newcomers to the Enterprise Europe Network and experienced partners to gain knowledge or improve their understanding of the main EU regulations on the marketing and safe use of chemicals. This can help you make SMEs aware of their rights and responsibilities, to encourage them to take action to comply and help forward-looking companies to seize the business opportunities of eco-innovation and sustainable chemicals management. This guide can be useful to all Network partners: Advisers on legal issues can use it to find out new sources of information and reach out to more companies that need to act; Technology and business advisers can integrate the regulation driven demand for safer chemicals and technologies into their services; Consortium leaders and sector group chairs are encouraged to consider structured cooperation with the national helpdesks in their countries and with ECHA. You can also find examples of good practice from the Network that could be relevant for your own activities in this guide. 10 10 Guide for SME Advisers EU chemicals management rules and your clients business 1. Introducing EU chemical safety law The general rules for the marketing of chemicals in the EU are set in REACH and CLP. These two horizontal chemical safety laws are complemented by the BPR, which is a sector specific piece of legislation. REACH, CLP and the BPR have a common aim to ensure a high level of protection for human health and the environment by making industry responsible for the safety of chemicals placed on the EU market. The regulations respond to important business and societal needs for sound chemicals management and their safe use. They apply to the European Economic Area (EEA), i.e. the 28 EU Member States and Iceland, Liechtenstein and Norway. SMEs have the same responsibilities as large companies and cannot be exempt from any of the requirements for chemical safety. The only SME specific provisions are to pay reduced fees and charges. 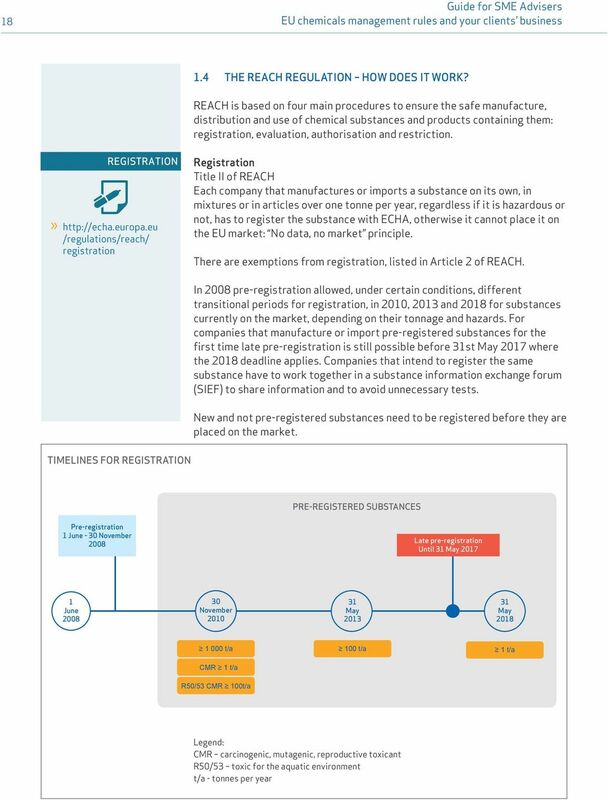 REACH Registration, Evaluation, Authorisation and Restriction of chemicals (EC) No 1907/2006 REACH is the regulation for the Registration, Evaluation, Authorisation and Restriction of chemicals (EC) No 1907/2006. It is the main EU law on chemicals, covering in principle all substances on their own or in mixtures or in articles for industrial, professional or consumer use. Therefore, REACH has an impact on most industrial sectors and applies to most companies in the EU. REACH sets the most ambitious chemical safety standards worldwide. Manufacturers and importers have to demonstrate how a substance they place on the market can be used safely and communicate the risk management measures to their customers. Communication in the supply chain is required by all actors to ensure the safe use. If the risks cannot be managed, authorities can restrict the use of a substance or make it subject to prior authorisation. The REACH requirements for chemical stewardship put pressure on companies to review their portfolio of chemicals and to replace the most hazardous ones with safer alternatives. One of the aims of the regulation is to stimulate innovation and enhance the competitiveness of European brands on international markets. CLP Classification, Labelling and Packaging of substances and mixtures (EC) No 1272/2008 CLP is the regulation for the Classification, Labelling and Packaging of substances and mixtures (EC) No 1272/2008. It complements the REACH Regulation and ensures that the hazards of chemicals are clearly communicated to workers and consumers through labels with standardised statements and pictograms. Before placing chemical products on the EU market, industry must classify them in line with the identified hazards and then label and package them according to the CLP system. This makes the hazard characteristics of the product easier to understand in the EU and worldwide and facilitates global trade as the CLP implements the United Nations Globally Harmonised System (GHS) of Classification and Labelling of Chemicals. 11 Guide for SME Advisers EU chemicals management rules and your clients business 11 The CLP regulation replaces the Dangerous Substances Directive (67/548/EEC) and the Dangerous Preparations Directive (1999/45/EC). 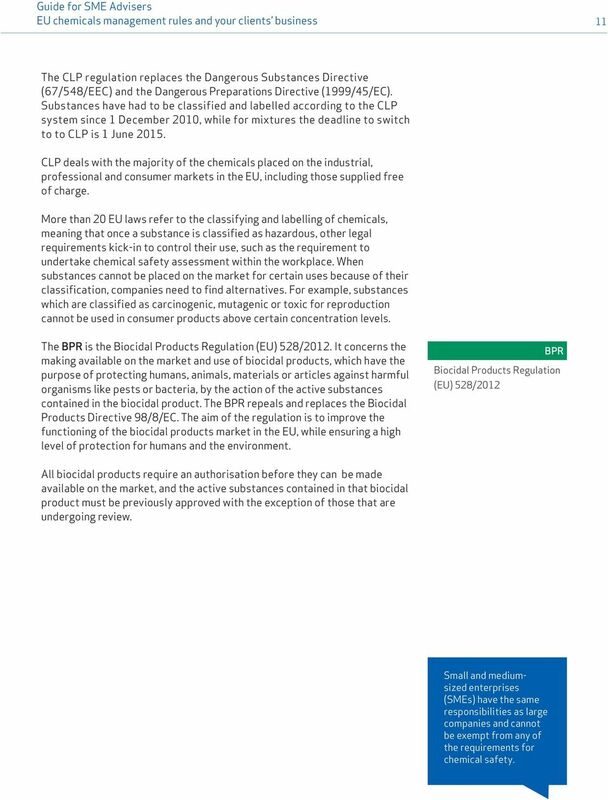 Substances have had to be classified and labelled according to the CLP system since 1 December 2010, while for mixtures the deadline to switch to to CLP is 1 June CLP deals with the majority of the chemicals placed on the industrial, professional and consumer markets in the EU, including those supplied free of charge. More than 20 EU laws refer to the classifying and labelling of chemicals, meaning that once a substance is classified as hazardous, other legal requirements kick-in to control their use, such as the requirement to undertake chemical safety assessment within the workplace. When substances cannot be placed on the market for certain uses because of their classification, companies need to find alternatives. For example, substances which are classified as carcinogenic, mutagenic or toxic for reproduction cannot be used in consumer products above certain concentration levels. The BPR is the Biocidal Products Regulation (EU) 528/2012. It concerns the making available on the market and use of biocidal products, which have the purpose of protecting humans, animals, materials or articles against harmful organisms like pests or bacteria, by the action of the active substances contained in the biocidal product. The BPR repeals and replaces the Biocidal Products Directive 98/8/EC. The aim of the regulation is to improve the functioning of the biocidal products market in the EU, while ensuring a high level of protection for humans and the environment. BPR Biocidal Products Regulation (EU) 528/2012 All biocidal products require an authorisation before they can be made available on the market, and the active substances contained in that biocidal product must be previously approved with the exception of those that are undergoing review. Small and mediumsized enterprises (SMEs) have the same responsibilities as large companies and cannot be exempt from any of the requirements for chemical safety. 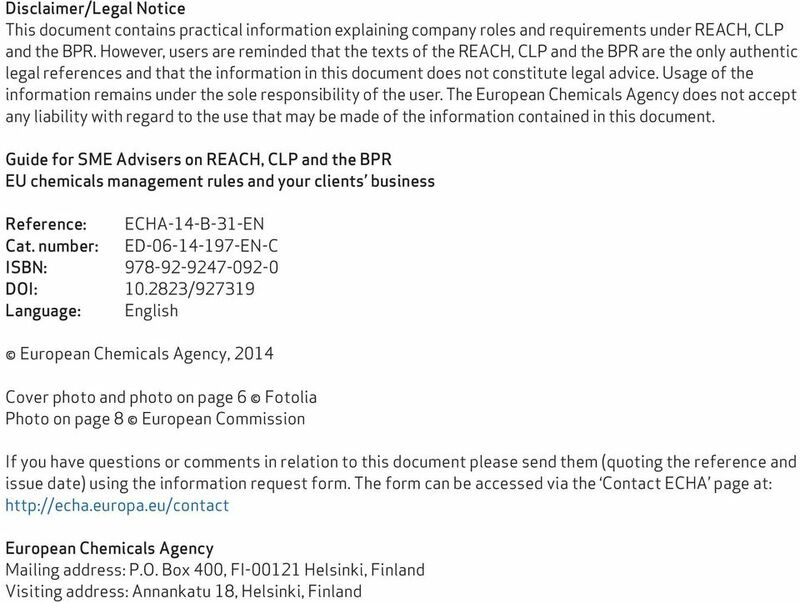 12 12 Guide for SME Advisers EU chemicals management rules and your clients business The European Chemicals Agency (ECHA) ensures the consistent implementation of REACH, CLP and the BPR. It provides information, guidance and IT tools for companies to prepare and submit the required information, and a helpdesk service to support them in complying with the law. Key information for SMEs is published in 23 EU languages on ECHA s website. 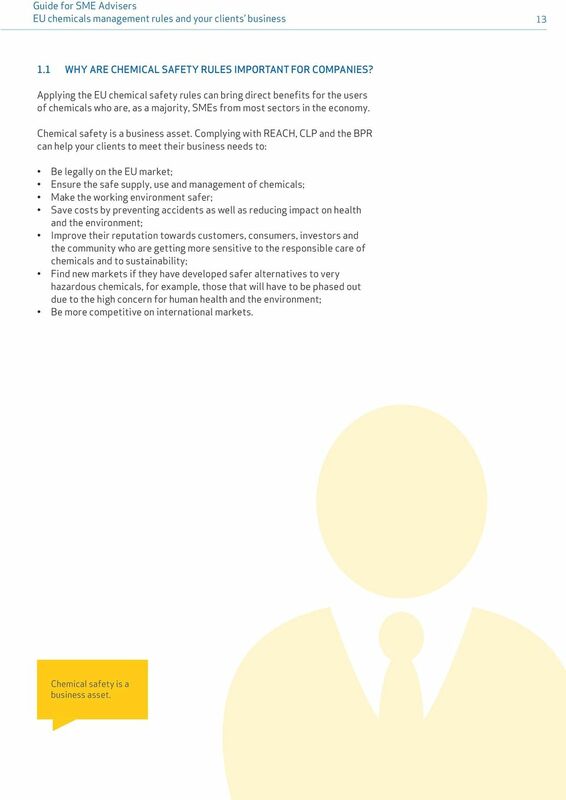 13 Guide for SME Advisers EU chemicals management rules and your clients business WHY ARE CHEMICAL SAFETY RULES IMPORTANT FOR COMPANIES? Applying the EU chemical safety rules can bring direct benefits for the users of chemicals who are, as a majority, SMEs from most sectors in the economy. Chemical safety is a business asset. Complying with REACH, CLP and the BPR can help your clients to meet their business needs to: Be legally on the EU market; Ensure the safe supply, use and management of chemicals; Make the working environment safer; Save costs by preventing accidents as well as reducing impact on health and the environment; Improve their reputation towards customers, consumers, investors and the community who are getting more sensitive to the responsible care of chemicals and to sustainability; Find new markets if they have developed safer alternatives to very hazardous chemicals, for example, those that will have to be phased out due to the high concern for human health and the environment; Be more competitive on international markets. Chemical safety is a business asset. 14 14 Guide for SME Advisers EU chemicals management rules and your clients business 1.2 WHICH CHEMICALS ARE COVERED? REACH, CLP and the BPR apply to a great variety of products supplied and used in the form of chemical substances, mixtures and articles. REACH and CLP define a substance, mixture and article as follows: REACH CLP Substance means a chemical element and its compounds in the natural state or obtained by any manufacturing process, including any additive necessary to preserve its stability and any impurity deriving from the process used, but excluding any solvent which may be separated without affecting the stability of the substance or changing its composition. examples: metals (aluminium, zinc, iron, chromium, etc. ), acetone, phthalates, ethanol. Mixture means a mixture or solution composed of two or more substances. examples: cement, paint, glue, ink, metal alloys, household cleaners. Article means an object given a special shape, surface or design that determines its function to a greater degree than its chemical composition does. examples: clothing, furniture, electronics and practically all objects of modern life. Attention: If the main purpose of the product is to release the substance, as in the case of a pen, perfume, ink cartridge, it is not considered as an article under REACH. It is a combination of a container (for example, a perfume flask) and its content (the perfume). Therefore, the container will be considered as an article, and the perfume as a mixture. BPR The BPR defines a biocidal product, an active substance and a treated article as follows: Biocidal product means: Any substance or mixture, in the form supplied to the user, consisting of, containing or generating one or more active substances, with the intention of destroying, deterring, rendering harmless, preventing the action of, or otherwise exerting a controlling effect on, any harmful organism by any means other than mere physical or mechanical action. Any substance or mixture, generated from substances or mixtures that do not themselves fall under the first indent, to be used with the intention of destroying, deterring, rendering harmless, preventing the action of, or otherwise exerting a controlling effect on, any harmful organism by any means other than mere physical or mechanical action. 15 Guide for SME Advisers EU chemicals management rules and your clients business 15 A treated article that has a primary biocidal function shall be considered a biocidal product. 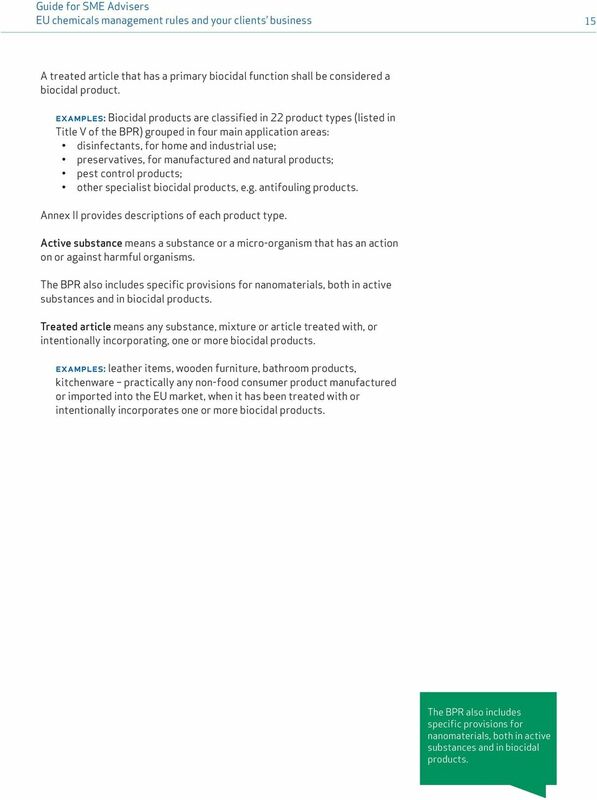 examples: Biocidal products are classified in 22 product types (listed in Title V of the BPR) grouped in four main application areas: disinfectants, for home and industrial use; preservatives, for manufactured and natural products; pest control products; other specialist biocidal products, e.g. antifouling products. Annex II provides descriptions of each product type. Active substance means a substance or a micro-organism that has an action on or against harmful organisms. The BPR also includes specific provisions for nanomaterials, both in active substances and in biocidal products. Treated article means any substance, mixture or article treated with, or intentionally incorporating, one or more biocidal products. examples: leather items, wooden furniture, bathroom products, kitchenware practically any non-food consumer product manufactured or imported into the EU market, when it has been treated with or intentionally incorporates one or more biocidal products. The BPR also includes specific provisions for nanomaterials, both in active substances and in biocidal products. 16 16 Guide for SME Advisers EU chemicals management rules and your clients business 1.3 WHO HAS TO COMPLY? All actors in the supply chain of a chemical product have an important role to control the risks and ensure the safe use of chemicals. Therefore, the requirements of REACH, CLP and the BPR apply to all of them. 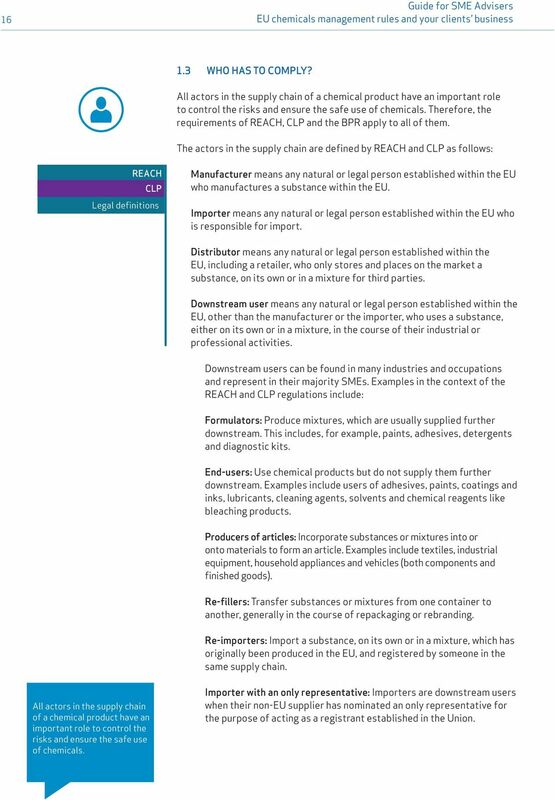 The actors in the supply chain are defined by REACH and CLP as follows: REACH CLP Legal definitions Manufacturer means any natural or legal person established within the EU who manufactures a substance within the EU. Importer means any natural or legal person established within the EU who is responsible for import. Distributor means any natural or legal person established within the EU, including a retailer, who only stores and places on the market a substance, on its own or in a mixture for third parties. Downstream user means any natural or legal person established within the EU, other than the manufacturer or the importer, who uses a substance, either on its own or in a mixture, in the course of their industrial or professional activities. Downstream users can be found in many industries and occupations and represent in their majority SMEs. Examples in the context of the REACH and CLP regulations include: Formulators: Produce mixtures, which are usually supplied further downstream. This includes, for example, paints, adhesives, detergents and diagnostic kits. End-users: Use chemical products but do not supply them further downstream. Examples include users of adhesives, paints, coatings and inks, lubricants, cleaning agents, solvents and chemical reagents like bleaching products. Producers of articles: Incorporate substances or mixtures into or onto materials to form an article. Examples include textiles, industrial equipment, household appliances and vehicles (both components and finished goods). Re-fillers: Transfer substances or mixtures from one container to another, generally in the course of repackaging or rebranding. Re-importers: Import a substance, on its own or in a mixture, which has originally been produced in the EU, and registered by someone in the same supply chain. All actors in the supply chain of a chemical product have an important role to control the risks and ensure the safe use of chemicals. Importer with an only representative: Importers are downstream users when their non-eu supplier has nominated an only representative for the purpose of acting as a registrant established in the Union. 17 Guide for SME Advisers EU chemicals management rules and your clients business 17 Downstream users are: Industrial users: Workers who use chemical products in an industrial site, which can be small or large. Professional users: Workers who use chemical products outside an industrial setting, for example, in a workshop, a client site, or an educational or healthcare establishment. Other typical examples of small businesses with professional use include construction and mobile cleaning companies or professional painters. REACH ACTORS Manufacturer Downstream users Professional end user Distributor Formulator Industrial end user Importer Consumer The Biocidal Products Regulation defines the actors as follows: BPR Legal definitions Substance supplier is a person established in the Union who manufactures or imports a relevant substance, on its own or in biocidal products. Product supplier is a person who manufactures or makes available on the market a biocidal product consisting of, containing or generating a relevant substance. 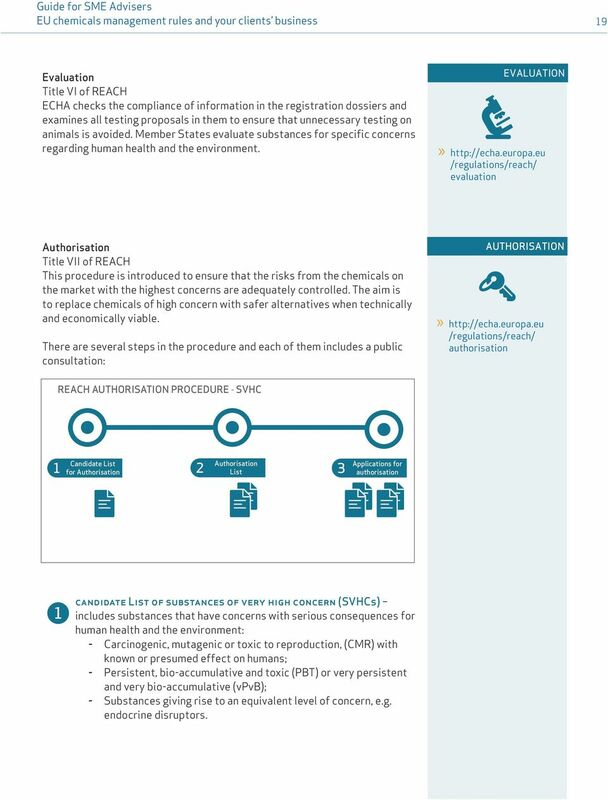 19 Guide for SME Advisers EU chemicals management rules and your clients business 19 Evaluation Title VI of REACH ECHA checks the compliance of information in the registration dossiers and examines all testing proposals in them to ensure that unnecessary testing on animals is avoided. Member States evaluate substances for specific concerns regarding human health and the environment. EVALUATION /regulations/reach/ evaluation Authorisation Title VII of REACH This procedure is introduced to ensure that the risks from the chemicals on the market with the highest concerns are adequately controlled. The aim is to replace chemicals of high concern with safer alternatives when technically and economically viable. There are several steps in the procedure and each of them includes a public consultation: AUTHORISATION /regulations/reach/ authorisation REACH AUTHORISATION PROCEDURE - SVHC 1 Candidate List for Authorisation 2 Authorisation List 3 Applications for authorisation 1 candidate List of substances of very high concern (SVHCs) includes substances that have concerns with serious consequences for human health and the environment: -- Carcinogenic, mutagenic or toxic to reproduction, (CMR) with known or presumed effect on humans; -- Persistent, bio-accumulative and toxic (PBT) or very persistent and very bio-accumulative (vpvb); -- Substances giving rise to an equivalent level of concern, e.g. endocrine disruptors. 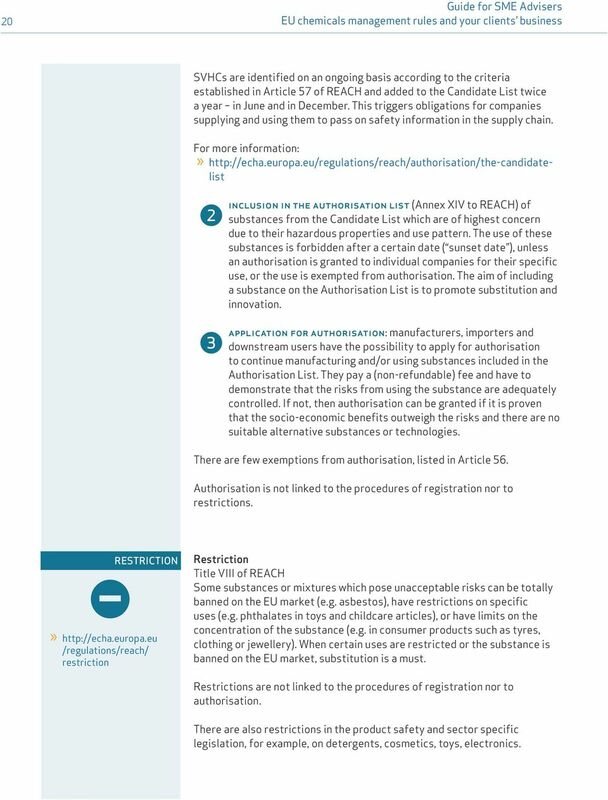 20 20 Guide for SME Advisers EU chemicals management rules and your clients business SVHCs are identified on an ongoing basis according to the criteria established in Article 57 of REACH and added to the Candidate List twice a year in June and in December. This triggers obligations for companies supplying and using them to pass on safety information in the supply chain. For more information: inclusion in the authorisation list (Annex XIV to REACH) of substances from the Candidate List which are of highest concern due to their hazardous properties and use pattern. The use of these substances is forbidden after a certain date ( sunset date ), unless an authorisation is granted to individual companies for their specific use, or the use is exempted from authorisation. The aim of including a substance on the Authorisation List is to promote substitution and innovation. application for authorisation: manufacturers, importers and downstream users have the possibility to apply for authorisation to continue manufacturing and/or using substances included in the Authorisation List. They pay a (non-refundable) fee and have to demonstrate that the risks from using the substance are adequately controlled. If not, then authorisation can be granted if it is proven that the socio-economic benefits outweigh the risks and there are no suitable alternative substances or technologies. There are few exemptions from authorisation, listed in Article 56. Authorisation is not linked to the procedures of registration nor to restrictions. 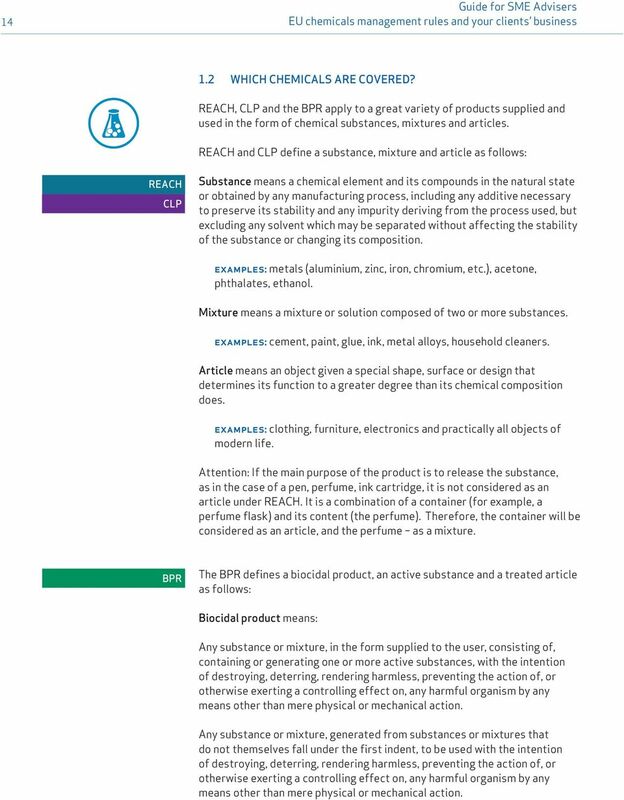 RESTRICTION»» /regulations/reach/ restriction Restriction Title VIII of REACH Some substances or mixtures which pose unacceptable risks can be totally banned on the EU market (e.g. asbestos), have restrictions on specific uses (e.g. 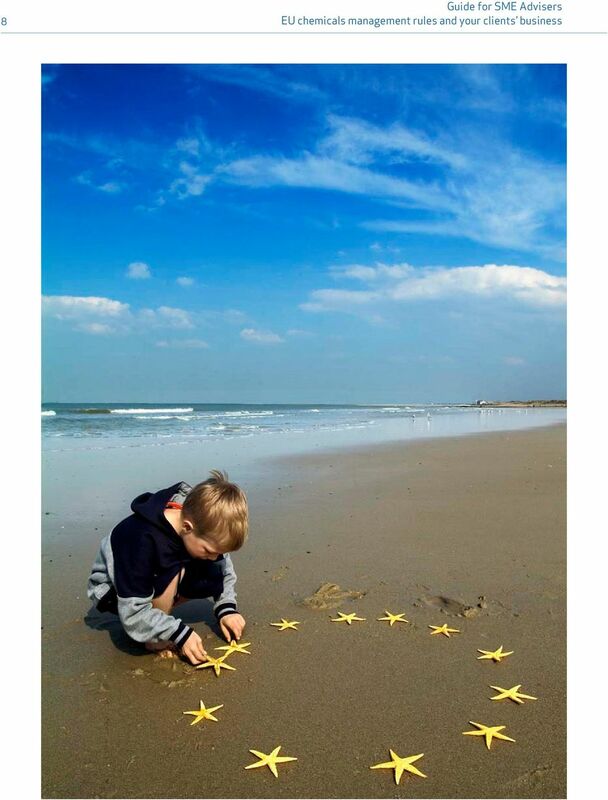 phthalates in toys and childcare articles), or have limits on the concentration of the substance (e.g. in consumer products such as tyres, clothing or jewellery). When certain uses are restricted or the substance is banned on the EU market, substitution is a must. Restrictions are not linked to the procedures of registration nor to authorisation. There are also restrictions in the product safety and sector specific legislation, for example, on detergents, cosmetics, toys, electronics. 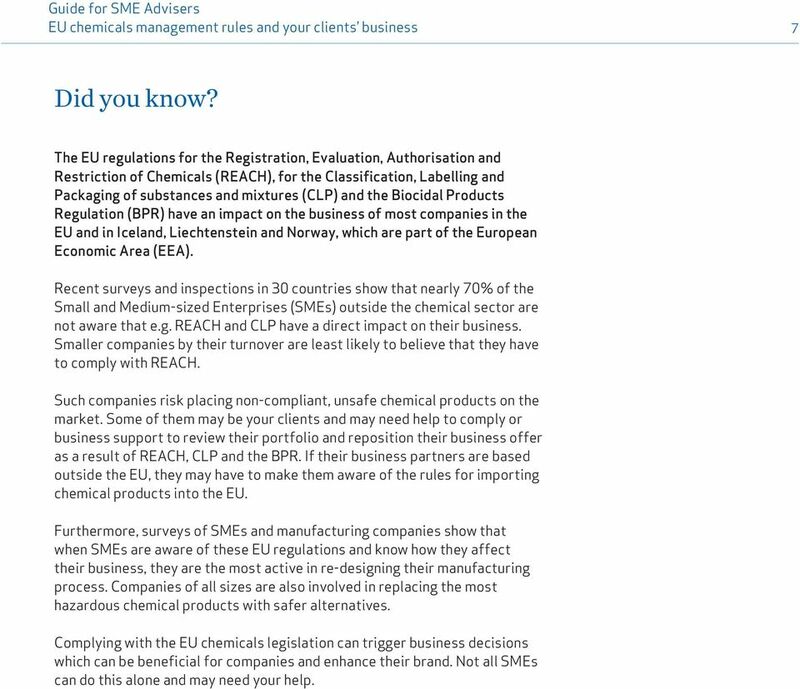 21 Guide for SME Advisers EU chemicals management rules and your clients business 21 WHAT IS REQUIRED BY THE DIFFERENT ACTORS TO COMPLY WITH REACH? REACH sets different requirements for the different actors, depending on their position in the supply chain and the product considered. Communication in the supply chain on chemical safety is required by all actors. Requirements for each actor: MANUFACTURERS OF SUBSTANCES Register the substance if the substance is manufactured in amounts equal to or above one tonne per year for each manufacturer, and if the substance is not exempted from registration. If the substance has been pre-registered, the deadline for registration is 31 May 2018 for substances placed on the EU market between 1 and 100 tonnes per year. Substances supplied in a higher volume and the most hazardous ones, e.g. those that are carcinogenic, should already have been registered in 2010 and Manufacturers and importers placing new substances and substances which have not been pre-registered on the market must register them before manufacture or import. Carry out a chemical safety assessment to identify and describe the conditions under which the manufacturing and use of a substance is considered to be safe and submit a chemical safety report (CSR). This is required when a substance is manufactured above 10 tonnes per year. Communicate safety information in the supply chain providing a safety data sheet for hazardous substances as required. The safety data sheet, which is governed by REACH (Article 31 and Annex II), is the main tool for communication in the supply chain to ensure better management of the risks from hazardous substances. Check if any substance is included in the Authorisation List (Annex XIV) or in the Restriction List (Annex XVII). In these cases it cannot be placed on the market without prior authorisation or used in the conditions described in the restriction. MIXTURE FORMULATORS As mixture formulators are using substances and/or mixtures: If the supplier of a substance or mixture is located inside the EU, the substances on their own or contained in the mixture should have already been (pre-) registered by their manufacturers. In this case, the mixture formulator is considered as a downstream user and does not have to register the substance, but has to comply with all other requirements for downstream users. If the supplier of the substance or mixture is located outside the EU and does not have an only representative in the EU, the mixture formulator is considered as an importer. In this case, they have to comply with the requirements for importers and has to register the substances used on their own or contained in the mixture. 22 22 Guide for SME Advisers EU chemicals management rules and your clients business When the formulator supplies the mixture downstream, they have the duty to communicate information on safe use and prepare a safety data sheet when required. For more information: In the raw material for a single product, which is a mixture, it is possible to have both cases. The supplier of one substance/mixture can be based within the EU and the supplier of another substance/mixture outside the EU. PRODUCERS OF ARTICLES A producer of articles has the role of a downstream user and has to comply with the respective requirements. In addition, an article producer may have one or more of the following obligations: Register a substance intentionally released from articles, if more than one tonne/year of that substance is placed on the market and if it has not been registered for this use by its manufacturer. This is, for example, the substance released from a scented toy. Notify ECHA of a substance on the Candidate List in the composition of the article in a concentration above 0.1% weight by weight and in a quantity above one tonne/year. Communicate information on safe use to customers if a substance on the Candidate List is contained in an article in a concentration above 0.1% weight by weight. At least the name of the substance has to be transmitted to the professional clients, and on demand to consumers. Check and make sure that no substance contained in the article is restricted for this use. Safety data sheets are not required for articles. For more information: Guidance in a Nutshell on Requirements for Substances in Articles Communication in the supply chain on chemical safety is required by all actors. 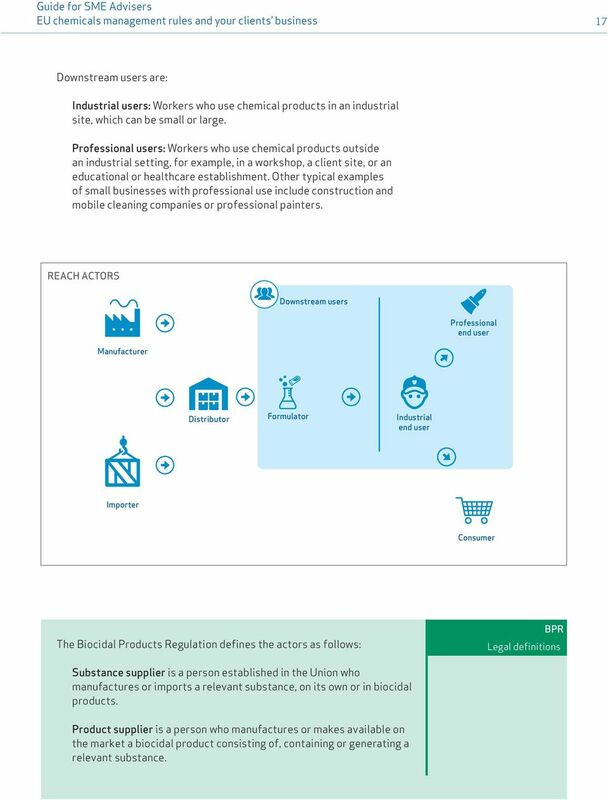 25 Guide for SME Advisers EU chemicals management rules and your clients business 25 DISTRIBUTORS The main priority for distributors is to ensure that the chemicals which they supply, comply with the registration, authorisation and restriction requirements of REACH. Two situations can change the role of a distributor: when they supply a chemical product directly from outside the EU they are importers when they re-package a chemical product or re-label it to include their brand, they are considered as downstream users. Communicate safety information to suppliers and customers Distributors are the communication link between manufacturers and their customers and play an important role to ensure the safe use of chemicals. They have to pass safety information up and down the supply chain. This could include information on the safe handling of chemicals received from the manufacturer and passed down to the customer in a safety data sheet as required or information from the customer on the use of the chemical passed up to the manufacturer or importer.! Distributors, including retailers, are not downstream users and do not have to register substances or apply for authorisation. Suppliers of articles must provide advice on the safe use of an article to industrial and professional users if the article contains a substance on the Candidate List in a concentration of 0.1% weight by weight. Similarly, they are obliged to respond within 45 days and free of charge to such requests from consumers. This can lead to additional pressure on industry to respond to consumer demands for safer products by replacing substances of very high concern with safer alternatives. All actors REACH requires manufacturers, importers, downstream users and distributors to keep information for 10 years from the date of the last supply of chemicals. 28 28 Guide for SME Advisers EU chemicals management rules and your clients business normally applies to the most hazardous substances such as carcinogenic, mutagenic, toxic for reproduction or respiratory sensitisers. Active substances for biocidal and plant protection products generally have harmonised classification. The harmonised classification provides a level playing field for all businesses in the EU market. Companies can also propose to harmonise the classification and labelling of a substance (except for active substances of biocides and pesticides) and/or take part in the public consultations on the proposals for harmonising the classification of substances. self-classification (set out in Annex I to CLP) applies to both substances and mixtures. It is required for substances when there is no harmonised classification for the given hazard class. If a mixture contains a substance with a harmonised classification, this information needs to be taken into account when classifying the mixture. There are normally five basic steps to decide on the classification: Identify all available data on the substances and mixtures; Examine the reliability of this information; Evaluate the information against the classification criteria; Decide on the classification; Review when new information becomes available. Companies can follow all these steps for classifying a mixture by using ECHA s website: LABEL»» regulations/clp/labelling HOW TO LABEL? CLP defines the content of a hazard label and the organisation of the various elements in it (Article 17 of CLP). The general rules for the application of labels are provided in Article 31 of CLP. A hazard label is made up of specific symbols (known as pictograms ) and warnings. Under CLP, the pictograms have been re-designed and given a new shape from the orange square to a diamond with a red border (see Annex I). New signal words, hazard and precautionary statements along with supplemental information replace the indications of danger, risk and safety phrases to be used to help workers and consumers understand the hazards and potential risks before they use the chemical products. The following example illustrates the requirements for the hazard label, including its dimensions and the position of the various elements. 30 30 Guide for SME Advisers EU chemicals management rules and your clients business CLP ROLES AND REQUIREMENTS AT A GLANCE Role in the supply chain Classify Label Package Notify ECHA Gather and keep the information for at least 10 years Manufacturer Yes Yes Yes Yes Yes Importer Yes Yes Yes Yes Yes Producer/ Importer of explosive * articles Downstream user** Yes Yes Yes Yes Yes Yes/No** Yes Yes No Yes Distributor/ Retailer** No** Yes Yes No Yes * Explosive articles and articles producing a practical, explosive or pyrotechnic effect (part 2.1, Annex I to CLP) **Downstream users and distributors have a possibility to take over the classification used by their supplier unless they change the product in any way (e.g. formulation of a new mixture). Ozone as active substance under the Biocidal Products Regulation Bernhard Paolini, Degrémont Technologies AG (OZONIA) and Chairman of the Ozone Registration Group Dr. Tim Pühmeier, Xylem (WEDECO); Dr.